Yadkin College, located near the Yadkin River in Davidson County, was opened in 1856 by the Methodist Protestant Church on land donated by Henry W. Walser. One of three institutions of higher education founded by Methodists in North Carolina-the others were Jamestown Female Academy and High Point College (now High Point University)-Yadkin initially offered only preparatory programs. It was rechartered as a college by the legislature in February 1861, but the Civil War forced it to close within a few months. A preparatory program operated briefly in 1865, and in 1867 Yadkin reopened as a secondary school. In 1873 Shadrach Simpson became the school's president, developed a college curriculum, admitted women for the first time, and built a new three-story building. His departure in 1883 marked the beginning of a decline in Yadkin's program to that of a junior college and, finally, a high school. The final director of Yadkin Collegiate Institute, as it became known under a new legislative charter, was William T. Totten, who in 1883 had been the last of the 19 students who received college degrees from Yadkin. Totten enrolled more than 100 students at the beginning of the twentieth century, but the establishment of public schools in North Carolina brought a decline in enrollment, and he closed the school's doors for the last time in 1924. Virginia C. Fick, Country College on the Yadkin: A Historical Narrative (1984). Olin B. Michael, Yadkin College, 1856-1924: A Historic Sketch (1939). "Yadkin College." N.C. Highway Historical Marker K-24, N.C. Office of Archives & History. http://www.ncmarkers.com/Markers.aspx?MarkerId=K-24 (accessed November 13, 2012). "Gone But Not Forgotten, North Carolina's Educational Past." North Carolina Collection, University of North Carolina at Chapel Hill. http://www.lib.unc.edu/ncc/gbnf/yc.html (accessed November 13, 2012). Greene, Mrs. Hobart. "Yadkin College Opened 100 Years This Fall." The Dispatch [Lexington, N.C.] June 7, 1956. 12. http://news.google.com/newspapers?id=ZxscAAAAIBAJ&sjid=KVEEAAAAIBAJ&pg=7027%2C6070420 (accessed November 21, 2013). Parker, Ellen Owen. "Yadkin College Was Once A Center Of Intellectual, Social Activity." The Dispatch [Lexington, N.C.]. November 16, 1977. 9. http://news.google.com/newspapers?id=RnoqAAAAIBAJ&sjid=mFEEAAAAIBAJ&pg=5971%2C1460842 (accessed November 21, 2013). 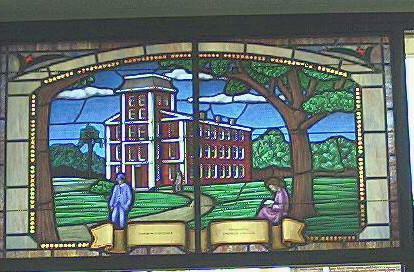 "Stained glass window depicting the surviving Yadkin College building. (Window is at the West Davidson Public Library, Tyro)." Photograph. Image courtesy of State Archives of North Carolina. http://www.ncmarkers.com/Markers.aspx?MarkerId=K-24 (accessed November 13, 2012). 1 January 2006 | McCaslin, Richard B.